1 Tuner + 1 or more non-Tuner monsters Once per turn, you can Special Summon 1 Level 4 or lower monster from your hand. You cannot conduct your Battle Phase the turn you activate this effect. Once per turn, you can destroy a Field Spell Card. If you do, gain 1000 Life Points, and you can add 1 Field Spell Card from your Deck to your hand. Ancient Fairy Dragon gained more and more play as it aged, until it finally was sent to the ban list. Generic materials needed, strong DEF, and able to combo great with Soul Charge. It’s tough to say which of AFD’s effects is the best. On one hand, you can blow up any Field Spell and search one, while gaining 1000LP. You don’t need to search a Field Spell to gain the 1000LP, so there’s some flexibility with its destruction power. That alone is a +1 and LP gain. Field Spell cards that gave advantage off destruction meant you weren’t losing anything off your own Field Spell destruction, were thinning your deck, and gaining LP, too much advantage for this card to be balanced. Also, this card could take as little as three cards to make (Instant Fusion, any card, One for One to get Glow-Up Bulb). The effect to Special Summon a Level 4 or lower monster from your hand is good, despite giving up your Battle Phase. This could combo with monsters like Chaos Sorcerer and Soul Charge that forced you to give up your Battle Phase or prevented you from attacking. If it wasn’t practical for you to attack that turn, you were given a free Special Summon off this card without needing another card. It wasn’t Ancient Fairy Dragon’s fault it got banned, it was the great Field Spell cards that came after it that gave the player more incentive to play Field Spell cards. Ancient Fairy Dragon rounds out the bottom five of this top ten with some balanced stats. She’s a generic Level 7 Light Dragon-type Synchro Monster with 2100 Atk and 3000 Def. She has 2 once per turn effects, but they aren’t hard once per turn effects, meaning if there is more than one on the field, do it more than once, Or if she leaves the field and comes back, do either effect again. But she’s banned now so none of this is happening. AFD’s first effect was to blow up Field Spells to gain 1000 Life Points, then you could search a Field Spell from your deck to your hand. At the cost of your Battle Phase you could also Special Summon a Level 4 or lower monster from your hand. I believe it’s this effect that got her banned. It’s just too easy to Special Summon Spam, and that is something that can’t be tolerated (except with Link Monsters). Life point gaining and searching is great too, but not really banned worthy because not every deck that runs great Field Spells runs Tuners. I didn’t put this on my list honestly because it was really only good in recent years when Field Spells got better and better and Destrudo became a thing, but this card is worthy of being in this slot on the list cause it is still great, even banned right now. First released in the 2009 Wave 1 Tins, we have Ancient Fairy Dragon. AFD is a Level 7 LIGHT Dragon Synchro with 2100 ATK and 3000 DEF requiring one Tuner and one or more non-Tuners. Again, great summoning requirements. ATK leaves more to be desired, but it makes up for with 3000 DEF. LIGHT and Dragon are overall amazing. Once per turn, you can Special Summon 1 Level 4 or lower monster from the hand but you cannot conduct the Battle Phase the turn you activate this effect. Back when this was released, losing the Battle Phase wasn’t worth a monster cause you couldn’t really make as many unbreakable boards. Now, with more summoning mechanics and more powerful monsters, an extra monster can help make a more powerful board for your opponent to try and break and losing the Battle Phase won’t matter when your opponent can’t out the plays you made. Also once per turn, you can destroy all Field Spells on the field (used to only be one cause there could only be one Field Spell at a time) to gain 1000 life points and you can add a Field Spell from the deck to the hand. Field Spells used to not be great really, but Arc-V really changed that with cards like Kozmotown and Dragonic Diagram and SPYRAL Resort. F.A.s love this as well. AFD was great if you had access to it to get your ever so important Field Spell, that is likely the reason this is banned right now. AFD could probably come back as the game speeds up eventually, but for now it does warrant a spot on the Forbidden List. Back when it was released it was probably a 3.25/5, so time has made this card better. 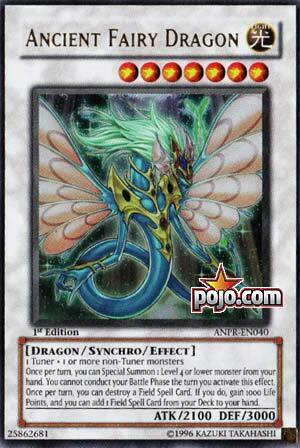 Art: 4.5/5 AFD is very beautiful, maybe the prettiest Signer Dragon, though maybe not the best looking. Fun Fact: This was the first Ghost Rare I ever pulled, pretty cool when you’re 11, still cool as I get closer to 21. Ancient Fairy Dragon gets her first re-review, and it’s very fitting. She’s one of those cards that definitely took some time to find her true potential, and Link and Pendulum Monsters were absolutely in love with her, as she sits Banned currently. That probably isn’t changing soon. Generic summon requirement, Light and Dragon are amazing, of course, weak at 2100 (3000 defense though), but we eventually broke her open. The two effects, while unremarkable, as a whole, at the time, grew into fruition. Being able to Special Summon a Level 4, or lower, Monster from your Hand once per turn…albeit at the cost of your Battle Phase. But all this does is essentially make an instant Synchro/XYZ/Link of your choosing (more so the latter two today) and the cost ended up being negligible as this helped speed and spawn various OTK/FTK Decks. Oh, and as for the second effect, destroying a Field Magic card and gaining 1000 Lifepoints, and then being able to add a Field Magic to your Hand (also, you can do this once per turn) helped do the same, as well as mentioning how Field Magic cards actually seem to only (have) become more prevalent in the game. This incorporates more burns and OTK into the game, so eventually, Ancient Fairy Dragon had to bite the big one.